The day before Mayor PARK Won-soon cut the ribbon with a dozen VIPs (see below), the new Seoul Hall Of URbanism and Architecture hosted a pre-Seoul Biennale Symposium. A perfect occasion to roam the venue, to the notable exception of the exhibition spaces, and key connections to the neighborhood's underground system, which only opened for the official inauguration. But before exploring this Seoul HOUR, how about a focus on the Biennale and its symposium? If the first symposium, held at the Seoul Museum of History in October 2015, questioned even the principle of a biennale (why not a triennale? ), this one went as far as presenting the material used to build the stands. A sharp contrast between an exploratory discussion two years before a first edition, and an operational briefing six months ahead of the second. A new tandem, LIM Jaeyong and Francisco SANIN, replaced PAI Hyungmin and Alejandro ZAERA-POLO at the heads of the bicephale biennale, knowing that, of course, SEUNG H. Sang remains close by, even if this time, he didn't take the mike (cameo apparitions on a few slides, though). 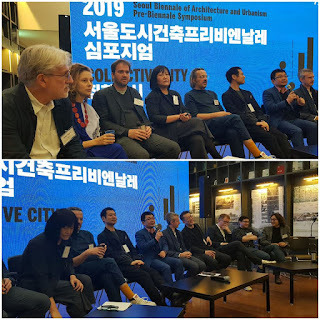 "#Seoul Biennale 2019 Symposium 20190327. Thematic exhibition (curator Beth Hugues): research and propositions around the 'collective city' notion, held in the DDP (Design Exhibition Hall, Design Pathway). Let's see what comes up from the various topics (typology, post-domestic city, mediation, heritage, infrastructures, ecology...). 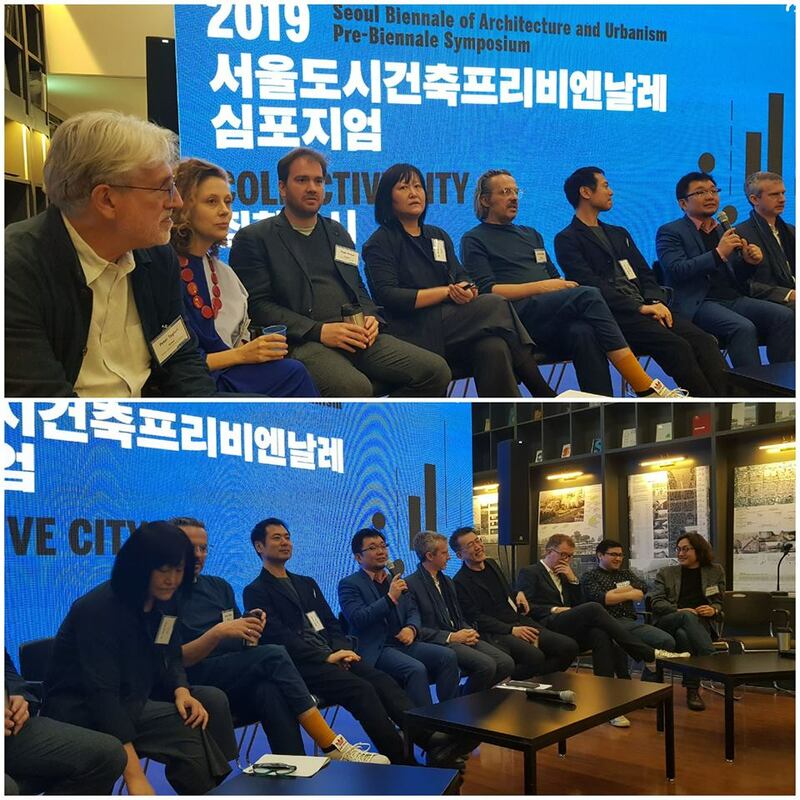 Cities exhibition (curators YIM Dongwoo, Rafael LUNA): I'm excited by the choice of Donuimun Museum Village and its Seoul Center for Architecture and Urbanism for the venue instead of the DDP, where the first edition took place. Mind you, that was a terrific exhibition, and they managed to make it not look like a fair, in spite of the site, but Sinmunno provides the perfect - if challenging - backdrop for a genuine global village, with actual alleyways. Dongwoo already researched innovative mapping axes for the 80 cities. 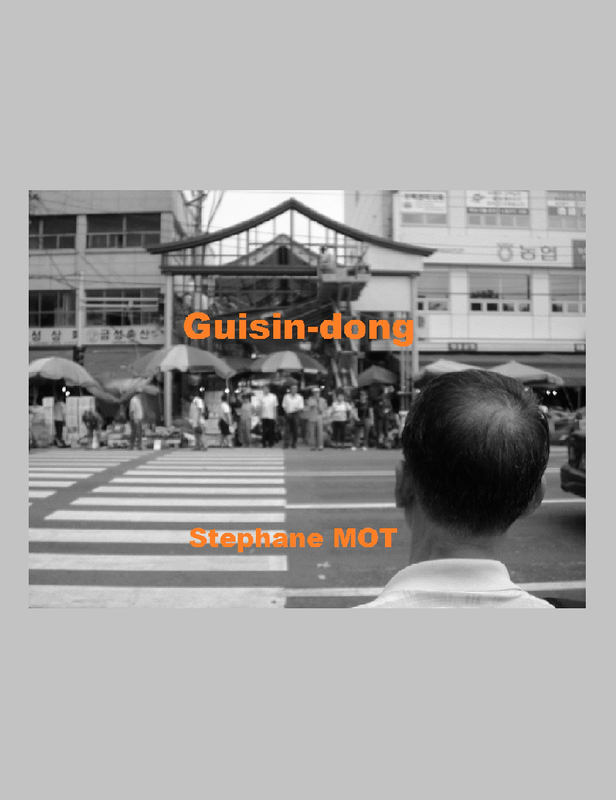 Global studio (curator CHOE Sanki): note the semantic shift from the 'international studios' of the first edition (curated by John HONG, who presented his return on experience). All events shall be concentrated around Seun Sangga (Sewoon Plaza, Sewoon Hall). Live Projects (curator JANG Young-chul): articulated around the concept of market, very relevant in the context of a collective city, particularly since, as JANG reminded us, the '시' in '도시' (city) means 'market'. 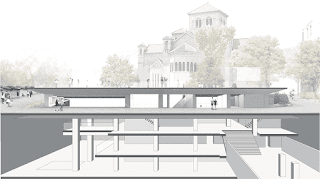 Two venues: Seun Sangga (Sewoon Plaza, Daelim Sangga), and the Seoul Museum of History. Jae-sung CHON's ode to the collective mess (he had me from the start by mentioning Kowloon Walled City and Seoul markets), and his fake news journal to project the reader in the future... that's my vision of urbanism, where you shouldn't sanitize everything, but leave room for organisms to evolve, grow, mutate by themselves. Peter Ferretto's respect for China's threatened wonders (beautiful project in Gao Bu, Hunan). CHO Minsuk's updates on Danginri and Bamseom, the rooftop theater of his Seoul Cinematheque. Erik L'Heureux's lyricism about HCMC's forgotten gems. He saw no connections to Seoul, but I couldn't stop thinking about my dear "Hoehyeon Apt, Chungjeong Apt, Dongdaemun Apt, Ogin Apt..."
So we now know how this 'Seoul Chronicle' works, and what its purpose is. From the beginning, I liked the minimalist approach with a focus on connectivity over and underground, the new building subliming surrounding structures: Deoksugung walls, the Seoul Anglican Cathedral, and even the less gracious Seoul Metropolitan Council, whose campanile almost ends up making sense. You can reach Seoul HOUR's rooftop from all sides, and face the stream of Sejongdaero as if from a non-scary diving board, with the bulging side of Seoul City Hall in front of you, Gwanghwamun to your left, and Seoul Plaza to your right. If you return to street level, you can also enjoy a panoramic view while sipping a cup of - what else* - coffee. Now in this kind of iceberg structures, you need to dive well below the surface, through 3 underground levels with relatively low ceilings, except in strategic places, and of course for 'VIUM Hall', the huge parallepiped going through all four levels. Frankly, the first impression of this main exhibition space is a bit disappointing: you can reach it directly through a central, monumental staircase that feels somehow like a Seoul subway entrance (yes, as advertised, Seoul HOUR is connected to the Sejongno underground network, which means among others City Hall, and the subway). Furthermore, halfway down, your first glance at the inaugural exhibition (about Vienna public housing) is from above, which makes it look smaller and weaker behind its scaffoldings. Video projections on the wall to your right don't quite make for the big dark void in front of you. I understand the architectural logic to prolong Deoksugung's walls, but from this angle, this corner is really too dark, and not exactly awe inspiring. But that can be fixed easily; a towering exhibit, or why not an ethereal SUH Do-ho fabric house? 'An-other Seoul', with a 3D map of the capital city reminiscent of the bigger one at the Seoul Museum of History, and an interesting scenario: what if, instead of reducing every year greenbelt areas (see "Land mining Seoul"), urban planners made better use of the sites related to infrastructure, which represent almost two thirds of Seoul's total surfce? 'Documenting the city', curated by LEE Sang-koo, with a focus on familiar lost villages (Sinwol-dong, Sanggye-dong, Geoyeo-dong). ** see "500 m, 80%, 100% urban crappuccino"